NEW DELHI, India, March 2, 2017 (ENS) – India’s National Tiger Conservation Authority has banned the BBC network and its journalist Justin Rowlatt from filming in any of the country’s tiger reserves for five years. The ban follows Rowlatt’s documentary broadcast by the BBC focused on India’s “shoot on sight” policy to combat poachers at Kaziranga National Park in Assam state. Rowlatt, the BBC’s South Asia correspondent, investigated and reported on “shoot on sight” conservation in the national park, in the documentary “Our World: Killing for Conservation,” first broadcast at 21:30 GMT on Saturday, February 11 on the BBC News Channel. The documentary focuses on forest rangers in Kaziranga who have been given powers to shoot and kill anyone they think is a threat to rhinos, tigers and elephants in the park. “The authorities at a national park in India protect the wildlife by shooting suspected poachers dead. But has the war against poaching gone too far?” Rowlatt asks in the documentary. Kaziranga rangers “have been given the kind of powers to shoot and kill normally only conferred on armed forces policing civil unrest,” Rowlatt says. Guards are “fully ordered” to shoot any intruders, according to a guard interviewed in the film, and are given immunity from prosecution if they kill or injure suspects. Singh says the term “shoot-on-sight” does not accurately describe how he orders the forest rangers to deal with suspected poachers,” says Rowlatt. The park director tells Rowlatt that during the past three years, 50 poachers have been killed. “He says it reflects how many people in the local community have been lured into the trade as rhino horn prices have risen. As many as 300 locals are involved in poaching, he believes,” Rowlatt says in the documentary. The locals are often tribal peoples who have lived in the park for generations. In July, a seven-year-old tribal boy was shot in the park. His family told Rowlatt their son was not cooperating with poachers but just looking for the family’s stray cows. Survival International, the global movement for tribal peoples’ rights, was interviewed for the BBC film, and fighting abuses perpetrated in the name of conservation. 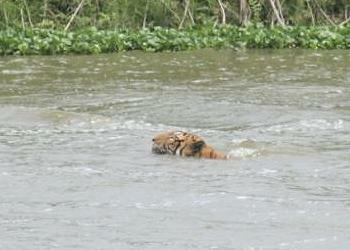 “Kaziranga will double in size and an eviction order has been issued. State police recently evicted two villages amid chaotic scenes in which stone-throwing villagers were beaten with batons and fired on by police. Two people – a father of two and a young female student – were killed,” Rowlatt reported. Meanwhile, Rowlatt and the BBC are no longer allowed to document what goes on in India’s tiger reserves. In a memo issued on February 13, the National Tiger Conservation Authority said BBC had failed to submit the documentary to the Ministry of Environment, Forestry and Climate Change and the Ministry of External Affairs for obligatory previewing “in order to remove any deviations, so as to achieve a balanced and accurate exposition of the theme,” the “Times of India” newspaper reported. The conservation authorities have also threatened to revoke Rowlatt’s visa. 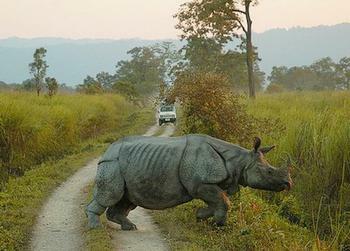 Kaziranga National Park, a World Heritage Site, hosts two-thirds of the world’s one-horned rhinoceroses, about 2,400 animals according to a 2015 census by the state of Assam and wildlife conservation groups. 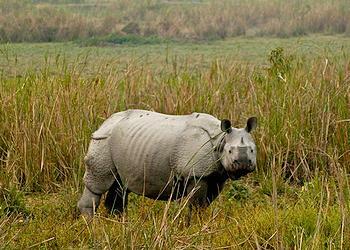 Kaziranga also holds the highest density of tigers among the world’s protected areas – an estimated 118 animals. It was declared a tiger reserve in 2006.